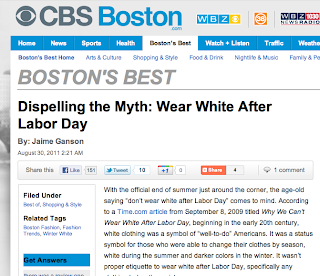 La vie Jaime : CBS Boston: My First Article! CBS Boston: My First Article! A month or so ago, I was contacted by a producer with the offer to write on CBSBoston.com in their Boston's Best section. I was thrilled at the prospect and opportunity to write for their Shopping & Style and Nightlife & Music sections. My first post is up today! 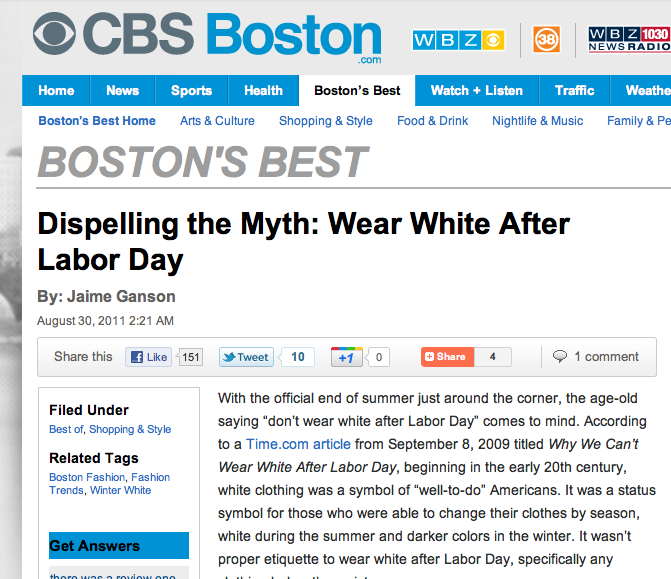 Check it out- Dispelling the Myth: Wear White After Labor Day. FABULOUS...congrats on the Article!!! YOU ROCK, and yes, I would wear white! Congrats my famous friend! That is too awesome! wowzers. that is AMAZING. congrats, jaime!!! Congrats! It's a really well-written article. Congrats on the article! Catching up on blogs now - your wedding photos are beautiful too! I like your hair and bridesmaid dress at Caitlin's wedding!